His Last Rodeo comes out in May and I recently got the cover. I thought my last book, Home Free was gorgeous, but this one? I got chills when I opened the file! 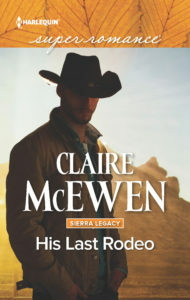 His Last Rodeo is the fourth book in my Sierra Legacy series, but each book can be read on its own if you aren’t up for tackling all four books. This one, especially, stands alone, I think. I’m excited that it’s coming out this spring! You can order it from the Harlequin website in April (and they often have sales, especially on Fridays.) Or you can get it at any online store, such as Amazon, Barnes & Noble, Kobo, or iTunes (and many more retailers) starting in May. More about the story to follow in other blog posts, but for now, please enjoy the pretty cover with me!